St Thomas a Becket, Shirenewton, is an excellent example of a Norman fortified tower church. 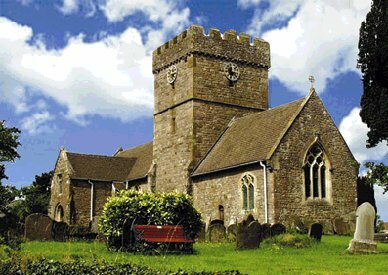 Situated in the centre of the village, it commands an elevated position overlooking the Severn Estuary and Bristol Channel. Built at the end of the 13th century by the fifth Humphrey de Bohun, the history of the church is currently being investigated by the Shirenewton Local History Society. 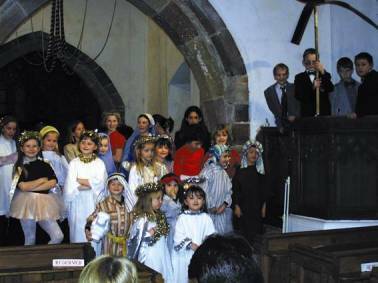 The church plays an active part in the community life of the village, with the annual "Christingle" event especially popular. There is a website dedicated to the church and associated fundraising activity. The six bells were restored in 1997 with the aid of a Millennium Grant, and are rung on Sundays and other special occasions. The clock, which has four faces, was paid for by public subscription and was installed in the tower as a War Memorial after the First World War. A further Millenium grant has helped pay for floodlighting of the church. Services are normally held at 9:45am on Sundays.